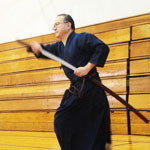 No Martial Art symbolizes the spirit of the warrior more than the art of kendo (“The way of the Sword”). Although the metal swords have been replaced by bamboo and wood, all other aspects of the Samurai Spirit live on in the practice of Kendo. Hollywood movies such as “The Last Samurai” exposed the art of Kendo to a huge audience, many of whom are unaware that over 40 countries participate in a world Championship, and 10 million practice worldwide. Kendo requires a strong spirit, physical strength and mental attitude to avoid defeat; Each attack is undertaken as it would have been from the Samurai, where death is the only outcome. Strike a killing blow requires good technique, but victory requires a single mindedness to defeat the opponent. In Kendo such courageous attacks develop the spirit which is necessary for victory. "Be better today than you were yesterday and then strive to become better still, never lose your spiritual equilibrium cultivate a mentality that allows you stay alert in every situation..."
Kendo (剣道) literally means "The way of the sword" in Japanese. It refers to the art of traditional Japanese fencing that was originally developed and practiced by Bushi or Samurai. 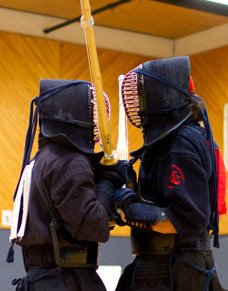 Kendo originated from the various sword fighting techniques of hundreds of years of combat and study. It deals with the physical and mental skills necessary for sword fighting. 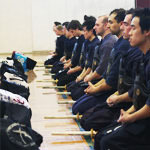 The goal of Kendo is not only to develop the physical capability for fighting but also the moral and spiritual aspects that may be applied in coping with real life. In Japan, it is one of the most popular martial arts. 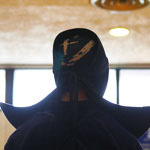 Kendo has spread to other parts of the world such as North America and Europe. It has developed a strong following in Canada and in Quebec as well.  Kendo is continually growing in popularity worldwide. 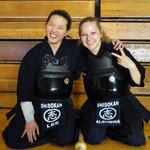 It is difficult to precisely say when and how Kendo originated. Kendo was not created nor developed by a single person or even a group of people. 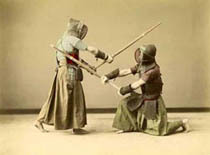 It was developed over a very long period of time from real combat and sword fighting situations. The sword was introduced to Japan from the Continent around the 2nd century BC. They say that the sword was originally a ritual colored object which symbolized the authority of its owner rather than a weapon. At that time, the catapult and bow were used for hunting or tribal warfare. However, the sword gradually became used for fighting through continuous group conflicts in the course of national unification. By the 7-8th century, the sword was being forged domestically. 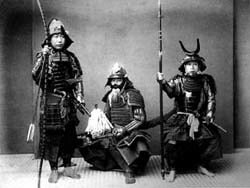 After the 9th century, as the Bushi class was established, the prototype of the Nihon-to (the Japanese sword) was formed. Various sword fighting techniques as well as forging techniques had been developed. However, on the battlefield, swords that were longer than 6 feet and spears were the main weapons until the 14th century. The years that followed were filled with civil wars, and it was during these times that schools of Kenjutsu, literally meaning the art of the sword, began. These schools were started by various master swordsmen, and each school had its own style unique to the originator. As the years passed and more peaceful times prevailed, more emphasis was placed on the spiritual aspects through the practice of Kenjutsu. These moral and social aspects stemmed from Zen Buddhism and Bushi-do (the way of the warrior) whose principle ideas were based on Confucianism. Since Samurai warriors were the only class allowed to carry a sword, mastering the sword was indispensable for any respected Samurai, in fact, it was considered to literally represent the spirit of Bushi. During the second half of the 18th century, the first real protective equipment came into being. These developments in protective equipment and the usage of Shinai (the bamboo sword) played an important role for the evolution of Kenjutsu practice. In the last days of the Tokugawa Shogunate, as the awareness for the need for national defense was growing, Kenjutsu became popular even among non-Bushi-class citizens. After the Shogunate government was abolished in 1867, modern Japan was formed and the Bushi class became extinct; the right to bear a sword was also banned. As a result, Kenjutsu temporarily declined in popularity. However, on suppressing the rebellion that broke out in 1877, the achievement of police officers who mastered Kenjutsu was highly respected. At the same time, there was a need to enhance the wealth and military strength on a national scale in order to compete with the Great Powers of the world. Under such circumstances, the promotion of Kenjutsu was reexamined. 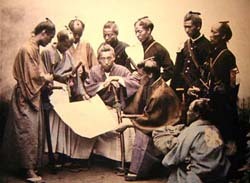 In 1879, the Metropolitan Police Bureau of Tokyo began giving Kenjutsu courses for its officers. In 1895, Dai Nippon Butoku Kai was formed as an organization devoted to all martial arts. However, the popularization of Kenjutsu demanded a universal form, one that would include and integrate all existing schools of Kenjutsu. In 1912, after a long deliberation among masters of major Kenjutsu schools, a new system of Kenjutsu that transcended existing schools was established. This is the birth of Kendo. 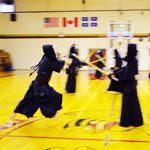 Since then, Kendo has officially become part of the physical education program initially at the secondary school level, and then in primary schools. 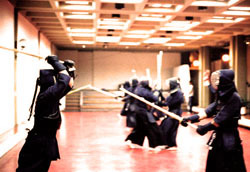 As a result, Kendo flourished, and many tournaments were held all over Japan. After World War II, Kendo suffered a major setback. 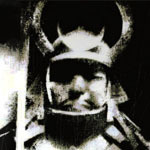 Kendo was regarded undemocratic by the general headquarters of the occupation forces and was officially banned in public. In 1957, due in part to the efforts of many Kendo enthusiasts, Kendo was restored. In the same year, the All Japan Kendo Federation was founded. Kendo grew into a national past-time again. However, it was now more of a martial art concerned primarily with the development of mind and body with the purpose of forging a better life rather than a method for taking life using a sword as it was before. Now, since the establishment of the International Kendo Federation in 1970, Kendo has become popular even outside of Japan. Countries such as Canada, Brazil, England, France, Germany, Korea, the United States, and many others have begun practice Kendo. 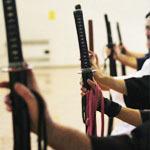 There are many more federations exist internationally, as people in other countries take increasing interest in Kendo. Modern Kendo is the result of many changes, from a purely fighting art, to an all encompassing martial art.